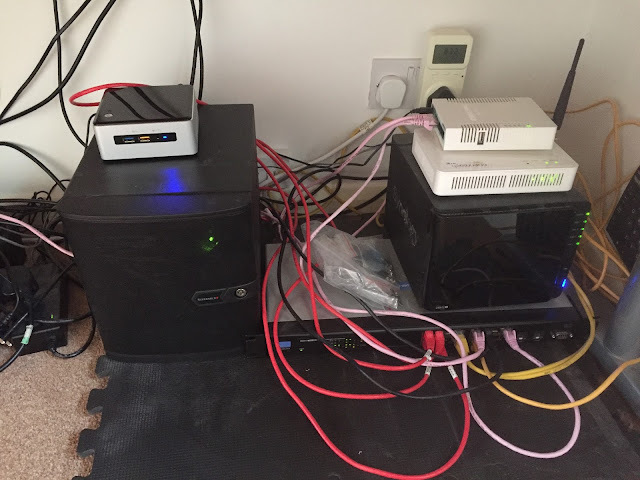 I normally leave all three hosts powered on but during holidays and quite periods I often power off two of them and just keep one permanently on which runs my Remote Desktop Gateway, Domain Controller and Jumpbox VM's. I wanted a new host that could handle at least 128GB Ram with sufficient CPU to run multiple nested ESXi hosts and NSX Managers / Controllers / Edges etc. I opted for a Supermicro SYS-5028D-TN4T (https://www.supermicro.com/products/system/midtower/5028/sys-5028d-tn4t.cfm) maxed out with 128GB RAM and only running a few local SSD's for storage as the bulk of my critical VM's still run on my Synology DS412+. This is what the bulk of my testing and demo VM's will be running on. I also purchased an Intel NUC (NUC6i5SYH) with 16GB Ram for my infrastructure VM's that need to be on 24x7. Both boxes are currently running ESXi 6.5 and so far they are all performing as expected. The NUC was a great choice as it's draws very little power and silent. It wasn't worth the extra money to max it out with 32GB Ram as the bulk of my resource intensive VM's will run on my Supermicro. Big thanks go out to Tom from Server Factory who sorted me out with a great deal on the Supermicro.